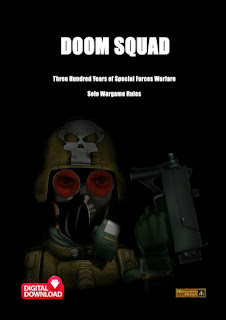 Having bought the excellent 5024 Escape from the Dark Czar starter set and having played the three enclosed scenarios using the included Flintloque core rules; I was hooked. The scenarios use all ten of the figures in the set and are great fun. You can pick up the basic rules quickly; although I realise I am still a beginner and there's a lot more to learn. Alternative Armies have released some excellent terrain items for Flintloque to go with these starter scenarios. There is set 5003A which includes small Stone Walls and a Camp Fire. 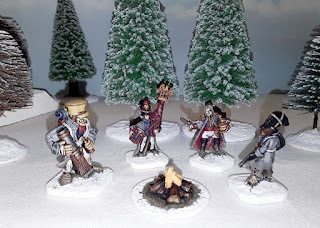 This is excellent for Scenario One as the Ferach force begin the game sleeping in their camp and the Camp Fire makes a great central point to position your figures around. This scenario is indeed perfect for your first game. It is very simple with Saindoux's band waking to find that the zombies are almost on top of them! The aim is for 75% of the Ferach force to escape the playing area. The zombies don't move quickly, but this is no consolation when you are rolling dice to wake your characters and they don't want to know (Monday morning maybe?). This makes things tense and exciting. Don't forget that as a last resort a character that is awake can drag a sleeping character 8cm, this probably saved Ayers in my first game; but that's teenagers for you! Scenario Two in Escape the Dark Czar brings another item of terrain into play as the Ferach force needs to collect resources from an abandoned cart while fending off the zombies. For your centre piece you can use set 59523 Abandoned Beer Wagon or set 59524 Abandoned Provisions Wagon. Either would be great but I was drawn to the Beer Wagon (not for the first but time!). These are lovely models in resin and the details are superb. They can be painted up quickly and help to build the narrative of these scenarios. 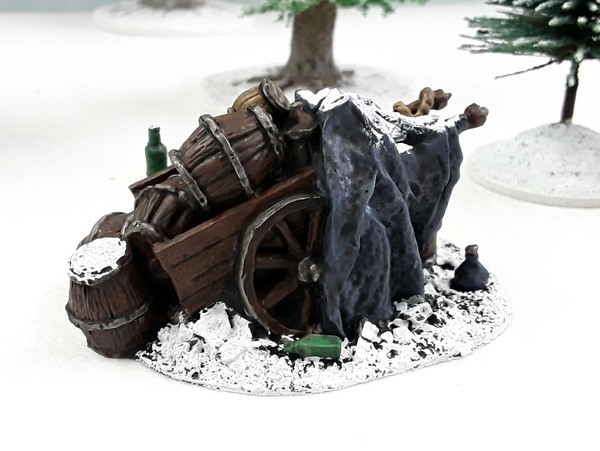 As you can see from the attached picture I've made use of some bottles from the BS17 Glass Bottles sprue when preparing the beer wagon for painting which just adds a personal touch to this fine model. Scenario Two is my favourite of the starter scenarios. Each of the Ferach characters has to collect food from the cart but you also need to inflict 50% casualties on the zombies without suffering 75% casualties yourself or the Undead win. The cart is great cover as otherwise there are only a few trees on the board. In my first game it was very crowded behind the cart, luckily there are no grenades or artillery available to the Savant Zombies.... When I get to Grapeshotte things will change! The final game, Scenario Three it is a fight to the death between the two sides in snow covered ruins but with the added complication of the chance of damp powder the first time each weapon is fired. The walls that come along with the Camp Fire can be useful for some of the smaller ruins. Victory goes to the first side to kill 100% of the opposing force. Remember to not get too close before first firing your weapon or a misfire can result in a very bad day! In my first game the Dogman Hulmutt Jucken tried a shot at close range and was very lucky that Boell Umfrage the Ogre was nearby or he would have had to fight 2 Savant Zombies on his own. The scenarios are all very good and work perfectly with the figures in the set while letting you try the various aspects of the core rules. There are some handy counters to copy and use on the same page as scenario Three, and the final two pages of the book are pre-filled Roster Sheets for the two sections which give you all the stats you need to use in your games. I found that after painting the figures in the starter set and having played these initial games, I wasn't ready to abandon Saindoux and his band to their fate just yet and I wanted to continue the narrative. I think this was the point of the starter set and I was hooked to find out what would happen next! 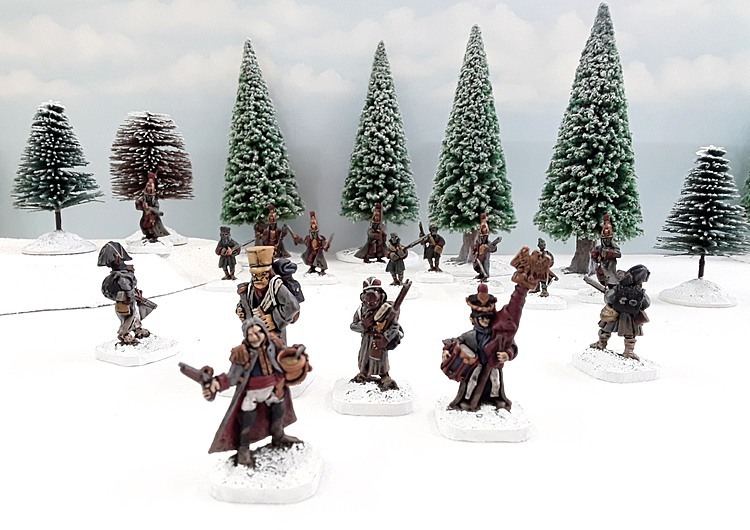 Having survived the pursuit of Captain Preserovitch and his Savant zombies so far they are still deep in the Witchlands with a long way to travel to get to safety. I also wanted to expand both forces from the great ranges of figures available. 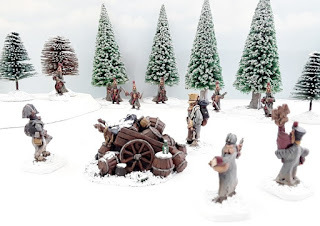 As I mentioned in my first article, I purchased a couple of figures from 56594 Witchlands Dogmen Line and the For Zombie Cossacks on foot from pack 55009. My plan was that as Saindoux's group and their pursuers travel through the Witchlands they gather others to them that they meet on their way. 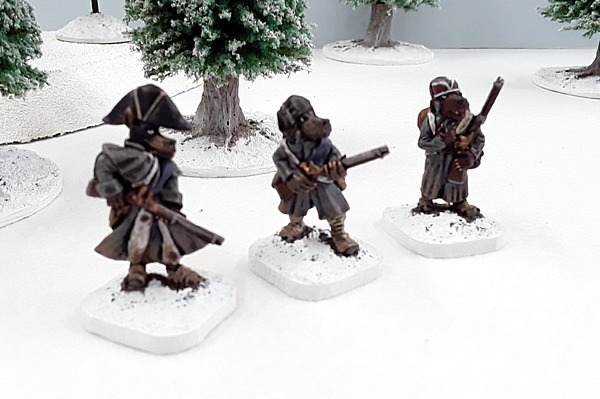 The Two Dogmen are Regular Infantry like Soldaten Hulmutt Jucken in the starter set, and likewise the Cossacks are Savant Zombies just like Captain Preserovitch's band. In the short term it is easy to use the stats on the starter set roster sheets to try the figures out as they meld right in. While I was happy to continue to play Flintloque from the 5024 booklet for the time being, I wanted to know more about the game itself. Especially the other units and races that form the Grande Armee Du Norde and the Dark Czar's legions. 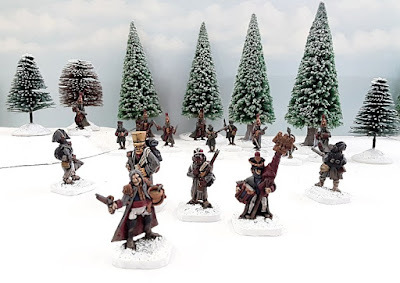 I therefore decided to buy the 5026 Death In The Snow game book and purchased it as part of the Shilling Service Pack which gave me more miniature is great value. Escape from the Dark Czar takes place in the same locations and time frame as the main game book. Once again I will let you know how I get on in the next article.